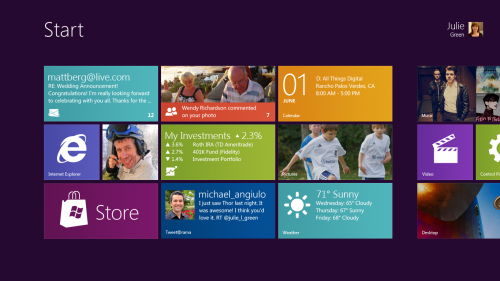 Microsoft’s Windows 8 has been confirmed to feature an App Store, following the growing trend amongst the industry to deliver content to consumers digitally. In a blog post earlier today, Microsoft introduced a number of teams working on Windows 8, including the “App Store” team. The Store is visible on this screen-grab from the new OS, which is heavily based upon the Windows 7 phone interface. Sliding-tiles offer easy access to real-time information and apps, and is a marked departure from the linear styling of previous Windows editions. The move is not a surprising one, and follows Apple who broke ground with the establishment of the Mac App Store for the digital distribution of Mac OS X Lion.